According to Automotive News, the 2017 Chevrolet Bolt EV is on target for production in 2016. GM recently moved the production target to the fourth quarter of 2016, rather than the start of 2017. 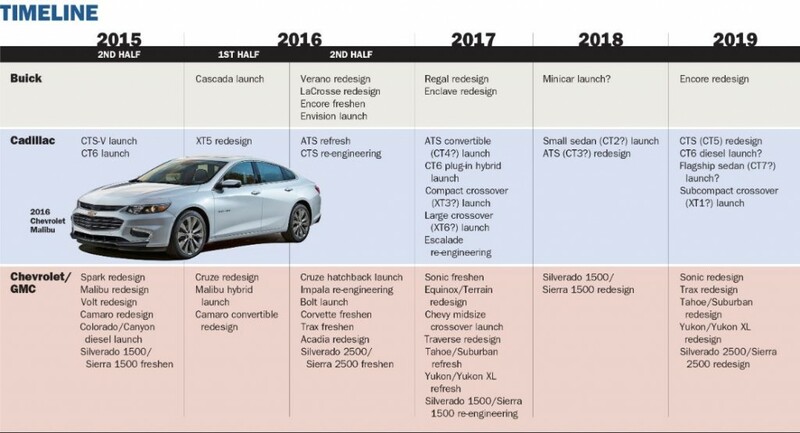 This is a timeline graphic produced by Automotive News of GM’s upcoming model release schedule – note the Bolt listed in the 2nd half of 2016. GM has said the Bolt EV will go 200 miles on a single charge, and will be priced at around $30,000 in the USA after federal tax credits. Chevrolet’s and GM’s plans for 2016 include a revamped car lineup, the launch of the Bolt long-range electric vehicle, a pair of new crossovers, and refreshed full-size pickup trucks. This entry was posted in Availability on August 19, 2015 by Admin.